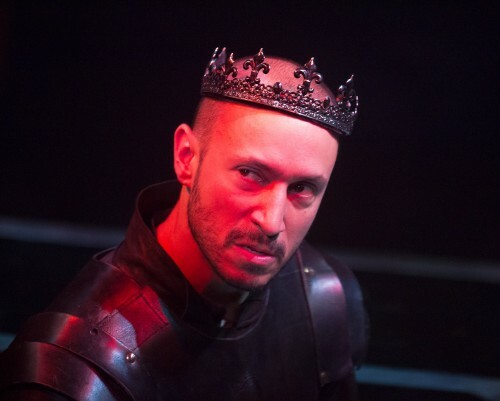 Drew Cortese stars as King Richard in Folger Theatre’s production of Richard III. At the Folger Theatre January 28 – March 9, 2014. Photo by Jeff Malet. The Folger Theater has transformed their faux Elizabethan courtyard into a theater in the round to produce Richard III, Shakespeare’s scenery-chewing tale of a conniving back-stabbing (and front and side and…) villain who claws his way to the top of the pile only to lose everything. It’s a curious choice of staging given Folger’s unique space and probably the most adventurous choice made in the production. The result is an enjoyable and well-acted production that doesn’t really excel in any particular manner but passes the time and showcases Richard’s willingness to mow down everyone in his way. The production staging is minimal by necessity, given the audience on all sides in seats without a lot of rise above the action. A half-dozen chairs or the occasional bier come and go quickly during scene changes and corpses get tipped, dropped, or lowered into traps in the stage. Deaths are quick and bloodless, which on the one hand tends to minimize their immediate impact, but the matter-of-factness with which they get carted off underscores the body count and Richard’s willingness to remove any obstacle. 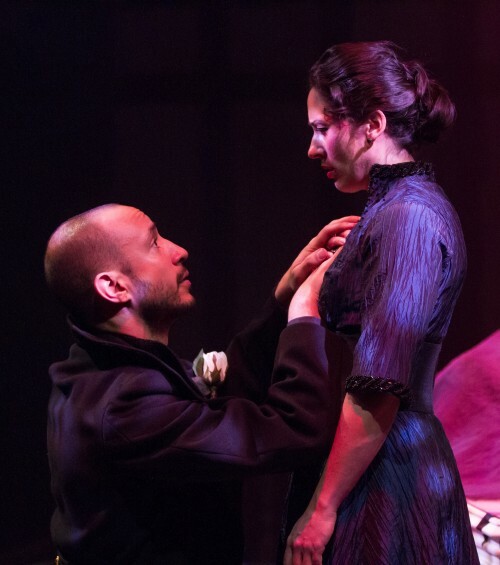 Richard (Drew Cortese) pleads with Lady Anne (Alyssa Wilmoth Keegan) in Richard III, at the Folger Theatre January 28 – March 9, 2014. Photo by Teresa Wood. The end result is a production where it’s entirely believable that Richard would manage to ascend to the top and the only thing that could unwind him is failing to attend to the demands of the co-conspirators who helped him get there. Or course he’d underestimate the need to hand out the favors he’s promised – when has anything stood in his way? It’s an entirely plausible arc, but the emotional punch of the end largely works out to a “yeah, okay.” It’s more an intellectual payoff than a visceral one, which left me with a sense more of “that was well done” than any sort of feeling in my gut. Folger Shakespeare Theatre’s production of Richard III runs through March 9. Located at the Folger Shakespeare Library, 201 East Capitol Street SE, Washington, DC 20003. Closest Metro stop: Capitol South (Orange/Blue lines). For more information call 202-544-7077.